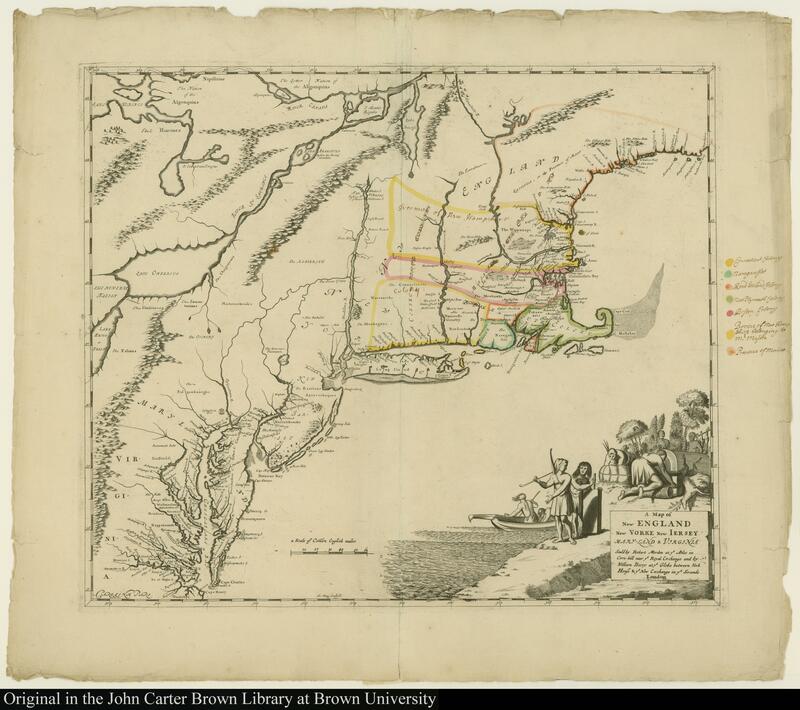 Why did a major war break out between settlers and Indigenous peoples of colonial New England? be able to explain how different forces – notably, religious, military, and economic power – affected the development of colonial North America. This week you should read the secondary source *before* you begin your posts. King Phillip's war was one of the worst wars in American history, with heavy losses on both sides. Its particular story is important. But it also helps us to think about the general issue of on-going relations between the Indigenous peoples of America and the increasingly large number of Europeans who were settling in, and thus occupying, what had been Indigenous lands. Discuss the colonists view of Indigenous peoples. How did they explain war with Indigenous people? Where did they find legitimacy for their views? Mason's book described an earlier war (the Pequot War, 1634-38). 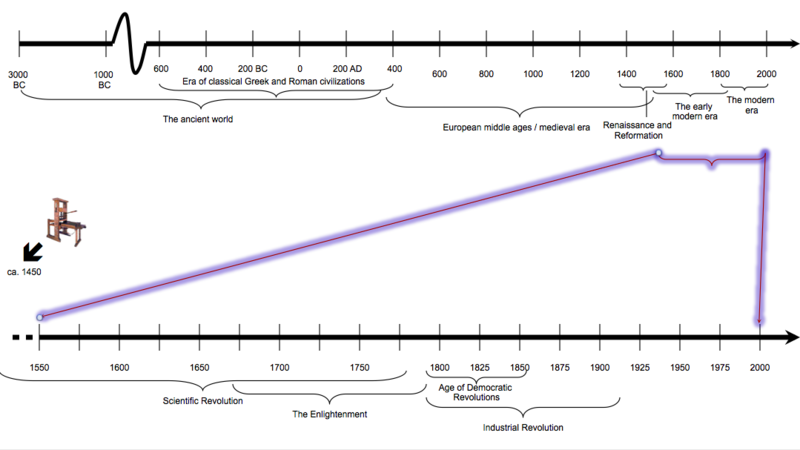 What can it tell us about 1675? 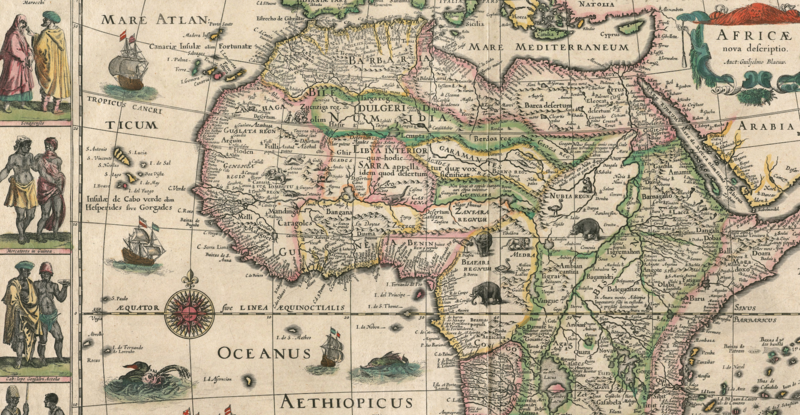 What does the 1676 map tell us about these colonial societies? There's also a modern map on page 63 of the Mandell text. 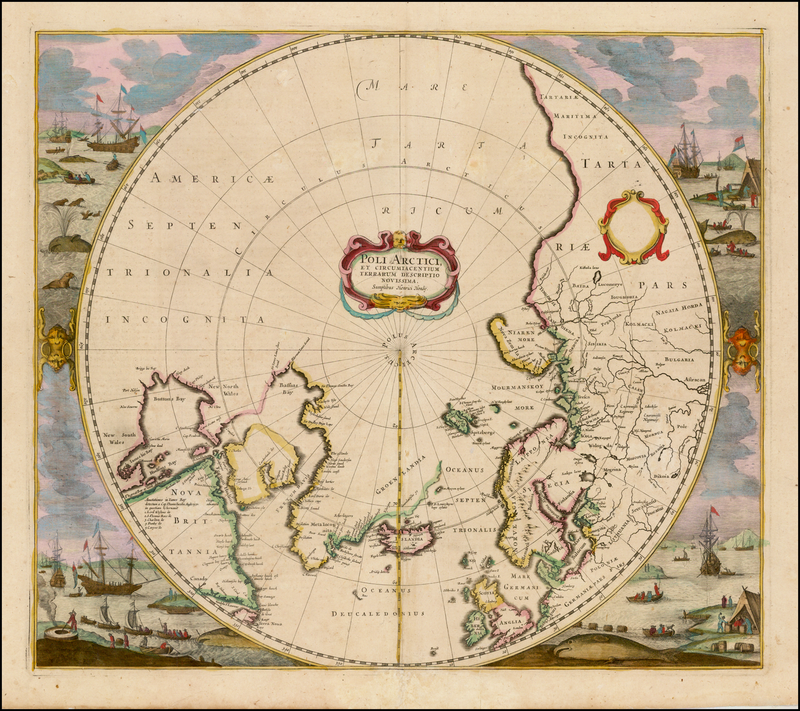 Compare the 1676 map with the modern map. What's different? 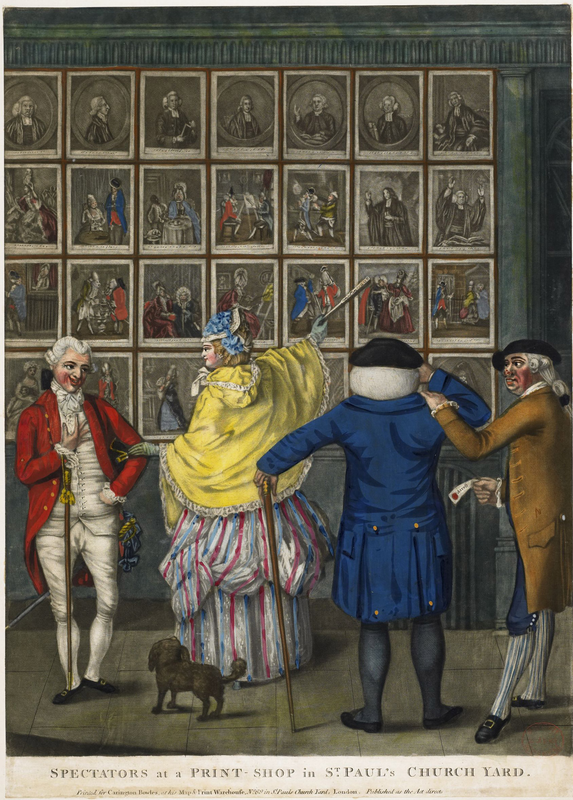 Rowlandson's book was exceptionally popular in its day, and has been republished many times since. You only have a small excerpt, but why do you think it was so important? What changed in 1675? What factors pushed people to take up arms in defence of their views? Compare the Wikipedia excerpt on King Philip's War and Lisa Brooks account. Of course, the Wikipedia entry convers the entire war, and you only read a chapter of Brooks, but look for the differences in the ways she tells the story, who she emphassies, and what assumptions she brings to the table. In 1675 a major war broke out in southern New England between English colonists in Massachusetts and Rhode Island and two indigenous nations, the Wampanoag and Narragansett. King Philip’s War, named for a leader of the Wampanoag people, was the biggest war in colonial history. At a time when the population of the entire region was around 80,000 people almost 9,000 died, two thirds of them Indigenous. This was a period of transition in the North American colonies. Virginia and Massachusetts, in particular, had grown significantly in the past 60 years but were not yet the mature colonies that would rebel one hundred years later; the Wampanoag had lost their dominant place in the region, but were not yet a politically or militarily marginalized people. The colonies were experiencing powerful internal tensions and external pressures. Internally, growth had brought about wealth and expansion. That same growth was adding pressure to surrounding indigenous peoples, many of whom determined to push back more forcefully. The result was one of the bloodiest wars ever fought. Not all of New England’s Indigenous peoples rebelled. 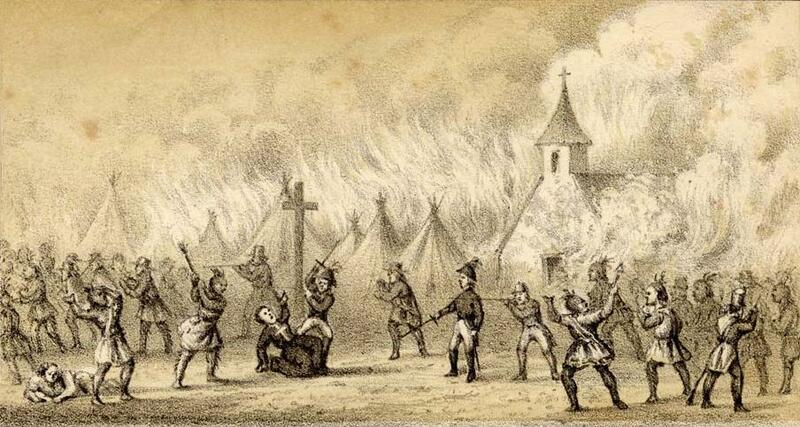 Many had converted to Christianity and a few of these “praying Indians” joined the attack (although in several instances that distinction was lost on colonial militias who often killed “Indians” on sight); others had long-standing poor relations with the Wampanoag and saw no reason to change that relationship. Indeed, in the later stages of the war, many Indigenous men fought with the colonists. Though the war was undoubtedly a war between colonisers and colonised, the lines were often blurred. The causes of King Philip's war continue to be debated. 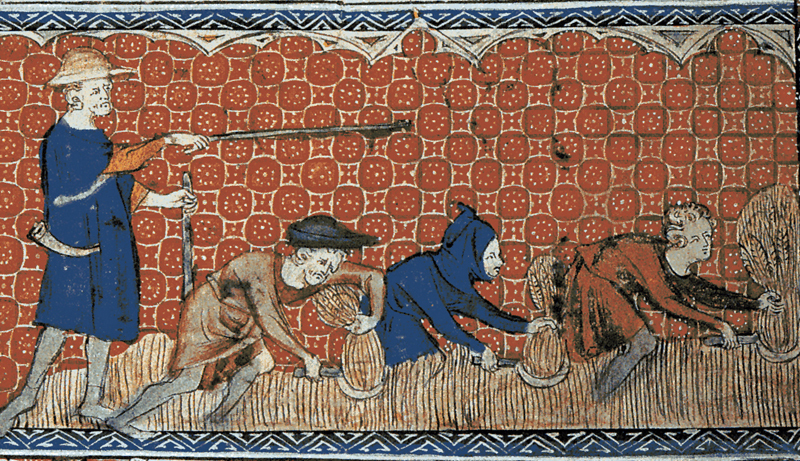 Early accounts portrayed the war as civilised Christians in a struggle against primitive pagans. Though sometimes showing some sympathy for the Wampanoag, the main thrust of the story usually portrayed the settlers as defending themselves from hostile "warlike" peoples. Most of the story, too, centres on the Wampanoag leader Metacom (KIng Philip), typically portraying him as having turned his back on the peaceful relationship his father had struck with the settlers, and thus having betrayed an informal treaty. Others focus on the murder of Sassamon, a Wampanoag man who had converted to Christianity, and thus portraying the story as a savage response to Chritianity overtaking their culture. More recent studies have offered a more contextual explanation focussing less on the immediate events that resulted in the outbreak of war and more on the longer-term deterioration of relations. The New Englanders, their populations expanding through high birth-rates and continued immigration, had pushed much more deeply and aggressively into Indigenous territory. What marks almost all these accounts, whether sympathetic to the settler or Indigenous perspectives, is that they assume Metacom was the leader of the Wampanoag, and it was his leadership defining the war. That he played a major part, no one disputes. But one recent book by historian Lisa Brooks has uncovered new research that casts wholly new light not only on another leader, but also on a leader who was female. Weetamoo was Metacom's aunt, but more importantly she was a respected leader among a broad group of kin-related Wampanoag peoples. Brooks's examination is grounded in rigorously detailed archival research, and urges us not only to rexamine our assumptions of settlers versus Indigenous cultures, but also to question our assumptions about leadership when the documents so often focus on men. As we've seen in a number of cases already, it's very difficult to see the history of preliterate peoples. Brooks offers us a first glimpse of what it might mean to more effectively assume an Indigenous perspective on settler-colonial stories - a perspective where settler assumptions might actually block us from seeing what really happened. Most of King Philip’s War was fought within 50 miles of Boston, but it also spilled over onto northern and western frontiers. This brought in other Indigenous peoples, most of whom were allied with the French in Canada and Acadia. New France has a smaller population than the British colonies, but dominated trade (and therefore military alliances) with many Indigenous peoples in what is now the US northeast and mid-west (Maine, Vermont, western New York, Michigan, and Ohio). Though not direct players in the early phases of King Philip’s war, the field of battle moved into northern New England in 1677 and 1678, and it began to draw in French allies such as a the Abenaki and Mi’kmaq (in what is today Nova Scotia and northern New England). The result was a decades-long frontier battle between French and English colonists and Iroquoian and Algonquian nations. The endless cycle of attack and counterattack is evident in some of our French readings this week. French colonization strategies were quite different than the English. Where the English brought in many settlers to “plant” colonies in the New World, the French strategy was based on trade much more than settlement. Thus, while the English strategy invariably put pressure on Indigenous communities, this was much less so the case with the French. One major result of these different strategies was that by the late 1600s the English greatly outnumbered the French. Nevertheless, both groups pushed against the frontier, and both were compelled to negotiate, or resist, the complex politics of Indigenous peoples in the interior. The general result was one of tension between the colonies of the two major European powers and among and between their Indigenous allies in America. While our readings focus on only one region in the late 17th century, those differences and their resulting conflicts, nevertheless, mirror much of the larger story of North American colonization. The defeat of the Wampanoag and their allies would come at a high cost for New England, both in terms of lives lost and the impact on their society and politics. It improved the colonists' security, establishing a base for the colonies' expansion through the 18th century (which we will examine next week). It would also, however, bring them into greater conflict with most northern and western Indigenous peoples such as the Abenaki and Mi'kmaq, and eventually with the Iroquois (Haudensaunee) - the dominant Indigenous nation of central North America. 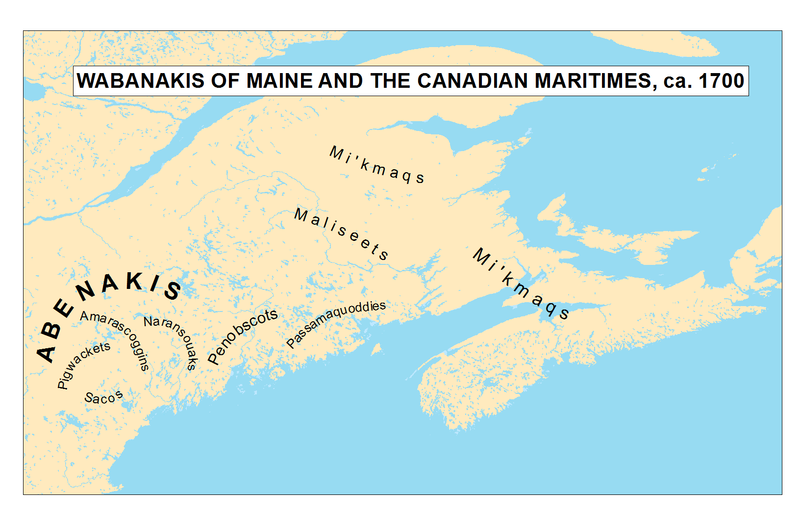 In northern New England, the Wabanaki Confederacy - an alliance of Mi'kmaq, Abenaki, Penobscot, and Maliseet peoples, with occasional French support - fought four wars with the Anglo-American settlers of what is now northern Maine and the southern Maritime provinces of New Brunswick and Nova Scotia. Over the next seventy years a series of smaller wars would be fought along the northern and western frontiers of New England. Of course, the Indigenous peoples of these regions didn't see this territory as English, but as their own. Further to the north, in the French colonies of Canada and Acadia, French colonial forces allied with these Indigenous peoples both for trading purposes and to weaken English efforts to push further inland. These protracted conflicts would culminate in an even larger war, the Seven Years War (1756-83), which would fundamentally reshape colonial and Indigenous North America (and which we will examine in two weeks!). In the historical memory of New England, the war shaped how generations of settlers would understand "the savages" who surrounded them. If some would convert to Christianity and show signs of accommodating to the colonists' ways, others seemed all the more intent to resist and the drive the invaders back into the sea upon which they arrived. There were several Anglo-Indigenous wars in the 17th and 18th centuries, though none were bigger, and none loomed larger in subsequent generations for what it taught them about Indigenous peoples. In the colonists' histories, Indigenous people were savages that needed to be contained, or crushed. Few stories caught this spirit more powerfully than the captivity narrative of Mary Rowlandson. Her story, published as a book shortly after the war and republished several times since, illustrated exactly what New England settlers thought about their Indian foes, and about themselves. The Indigenous captors were cruel and primitive; they ate barbarous foods; they engaged in horrendous practices. Mary Rowlandson, on the other hand, was a model of Christian womanhood: an innocent who lost her husband and child in an attack, suffering at the hands of cruel Indians, but kept strong by her Christian faith and noble demeanour. The story, as we'll see, also shows indications of Indigenous kindness, and New England barbarism, but the main elements of the story highlight a just fight against a cruel opponent. The narrative never considers the plight of the Wampanoag, that their people were dying of Europeans diseases, that their land was being taken away, and that New England officials continued to push back after every concession. For generations afterward, this message for the colonists remained powerful, a clear story of the justice of their actions. We can see it very differently today, but we should also strive to understand that worldview - to understand what allowed people to believe so firmly in the correctness of their ways. But the war surely does contain in miniature a view of the larger state of settler-Indigenous stories. Not all were so violent, not all so clearly captured the naked ambition of New England colonization, not all were so powerfully and effectively narrated. But no story illuminates more effectively the broader pattern of warfare in securing European holds on the so-called New World. Review all of the Toolbox entries from last term before you read the sources, and practice applying the skills you've learned so far in this course. All of these entries are now available in one spot, a new page that you can find in the navigation menu on the top-left of the e-textbook, or by clicking here. Read at least three of four of these primary documents. Note the first document is from an earlier New England-Indigenous war (the Pequot War, 1636-38), and the final two are from French territory in what is now northern New England. The first document offers a reminder that King Philip's War was part of a longer miltary history, and also (as we saw a few weeks back) a longer set of assumptions guiding the thinking of colonial New Englanders. The last two documents are a remidner that the war didn't simply end in 1678 and that in many ways it continued further north. John Mason, A Brief History of the Pequot War: Especially of the Memorable Taking of Their Fort at Mistick in Connecticut in 1637 (Boston, 1639) reprinted in History of the Pequot War, Charles Orr, ed., (Cleveland, 1894), 6-8 and 28-31. Cotton Mather, Magnalia Christi Americana (Boston, 1855 [orig. 1702]), 556-62. 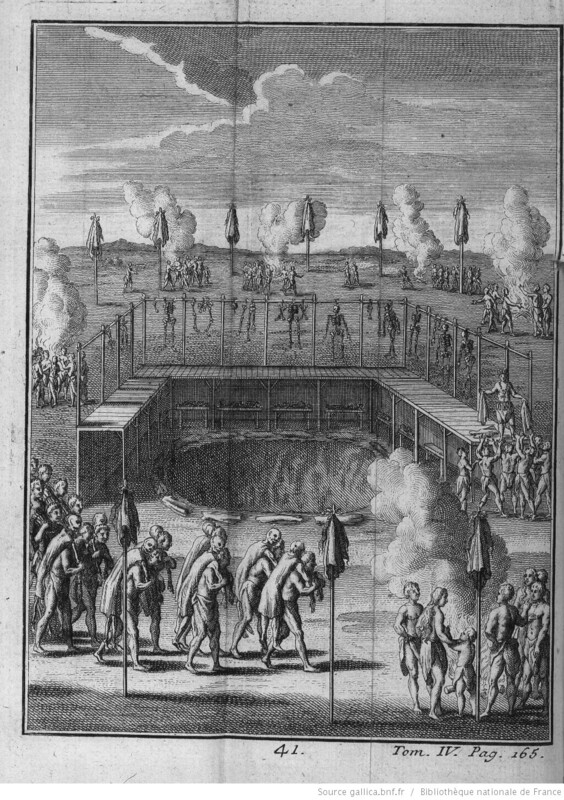 John Easton, “A Relation of the Indian War” (1676). 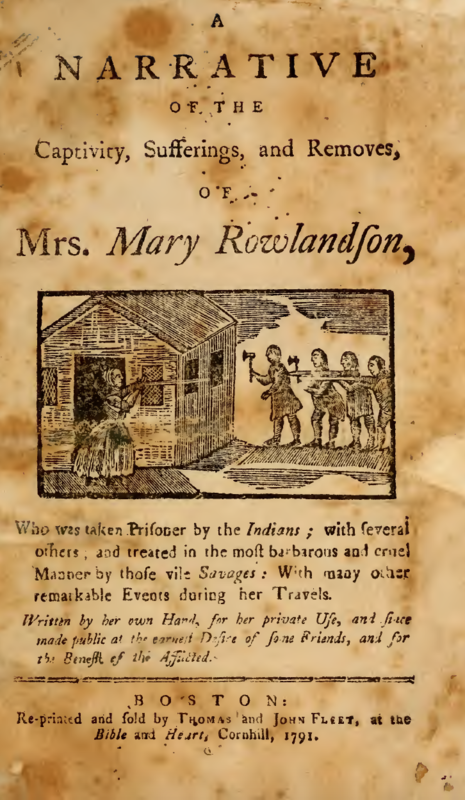 Mary Rowlandson, A Narrative of the Captivity, Sufferings, and Removes of Mrs Mary Rowlandson (Boston, 1791 [orig. 1685], 14-18. Increase Mather, A Brief History of Warr with the Indians of New-England (1676), pp. 9-15. (Note: Read up until the last full paragraph in the middle of p. 15). Report of Governor Joseph Robineau de Villebon, 1691-2 in John Clarence Webster, ed., Acadia at the End of the 17th Century: Letters, Journals, and Memoirs of Joseph Robineau de Viillebon, Commandant in Acadia, 1690-1700 (Saint John, NB, New Brunswick Museum, 1979 ), 57–66 [account of an attack against an English settlement, 1694] and 89–94 [account of an English attack on Fort Nashwaak – near modern-day Fredericton, Oct 1696]. Sieur de Dièreville, "The Account of the Customs of the Settlers as well as the Indians of New France," in Relation of the Voyage to Port Royal in Acadia or New France, Mrs. Clarence Webster, trans., John Clarence Webster, ed. (Toronto, Champlain Society, 1933), 89–97. Lisa Brooks, Our Beloved Kin: A New History of King Philip's War (New Haven, Yale University Press, 2018), 115-39. You might also benefit from listening to Lisa Brooks discuss her book in this podcast. Generally, how would you characterize the colonizers' accounts of Indigenous peoples? How would you characterize the relationship? have an advanced awareness of how perspective affects how we understand historical sources. For this week you are required to read one of two secondary sources (see the instructions in the Secondary Sources section). However, if you would like to read BOTH sources, you are welcome to do so. You've recently completed a transcription assignment that required you to read slowly. With that in mind, we're asking you read only TWO primary documents, and to do so slowly. We know you're really busy these last weeks of term, so we'll keep the Forum opened longer, extending it just a little until next Thursday (the 29th); you'll have 8 days with the material while you also complete the last part of the Voyant Forum. Take your time; read a doc, post, wait a few days, read another doc and some posts, make a response, and so on. But stay engaged throughout the week. Let's develop a great conversation this week! In addition to the primary sources, we're also asking you read one of two secondary sources, and then to have a conversation comparing the two sources. Your group colour will determine which of the two to read (see below and in your Forum for details). Everyone should plan to post something by the end of the day on Monday the 26th! Try to build on each other's comments: reply, debate, and ask questions of each other (in a friendly and constructive way!!) so that you push each other to learn more together. The two secondary sources this week offer different perspectives on Indigenous history. Read the posts of your classmates who are reading the same text as you, and those reading another text. Compare. Discuss. As always, for full credit in the Forum you should have at least two posts: one by the end of the weekend, and another by the end of the Forum (sooner if possible), and before you write both posts you should read and review all previous posts so that you are building upon and not repeating each other's ideas. How the secondary accounts of Paul and Salisbury differ? How are they the same? Are their perspectives visible in their writing? Describe what the documents allow us to see as some of the distinctive and important features of Indigenous societies. Do you see evidence in our primary documents that amplify, support, contradict what you see in Salisbury or Paul? Compare what your seminar-mates have to say about the secondary source that you didn't read. How are their perspectives similar/different than yours? What struck our European writers as most interesting in their descriptions of the Indigenous societies they encountered? What, in Lahontan’s mind, were the criteria for assessing the interests of Indigenous and non-Indigenous peoples? Does Lahontan’s account offer us another way to think about the native-newcomer relations? Early in his account, White is relating tales of some rituals underway. What was going on here? What else does White's account help us to understand of early modern Indigenous peoples? Of the meeting of European and Indigenous peoples? We again face the issue of having sources written about our subjects, but not by our subjects. What do they allow us to see about Indigenous peoples? Do any of the primary documents allow us to see what Indigenous people thought about the colonizers? ​Much of the larger pattern of Atlantic history can be seen in the interconnectedness of the different stories. As we saw two weeks ago, the slave trade initiated one of the great demographic shifts in global history. 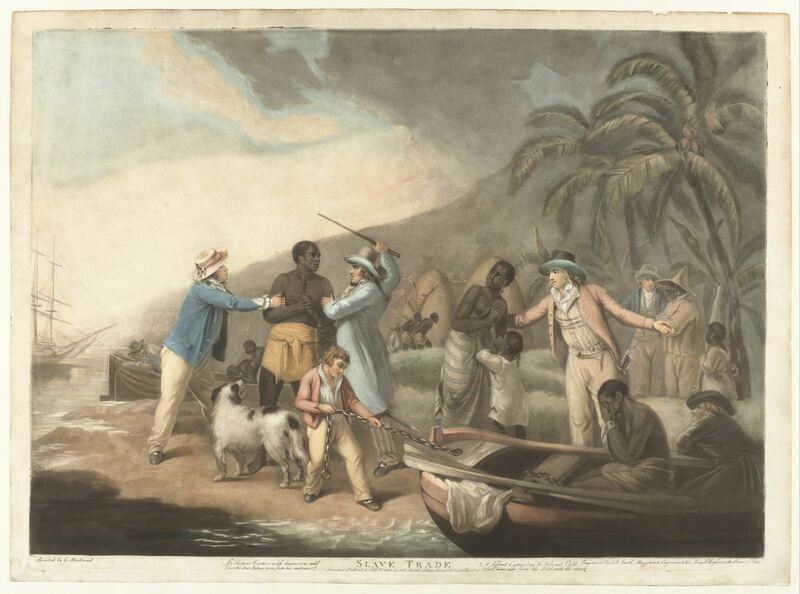 At least 10 million Africans were forcibly relocated to the Americas, as slaves, where their labour enabled the development of large-scale production of sugar, cotton, rice, tobacco, indigo, and other staple products. Early colonization plans had imagined Indigenous peoples would supply that labour, but, as we saw in the week on the Columbian exchange, huge swaths of that population had been cut down by European diseases that spread through the Americas. Colonization’s inadvertent depopulation of one region led to colonialists’ deliberate depopulation of another. This relatively new understanding of the biological consequences of overseas expansion has changed the way we understand that larger story. It’s also very much changed how we think about Indigenous peoples and their history. 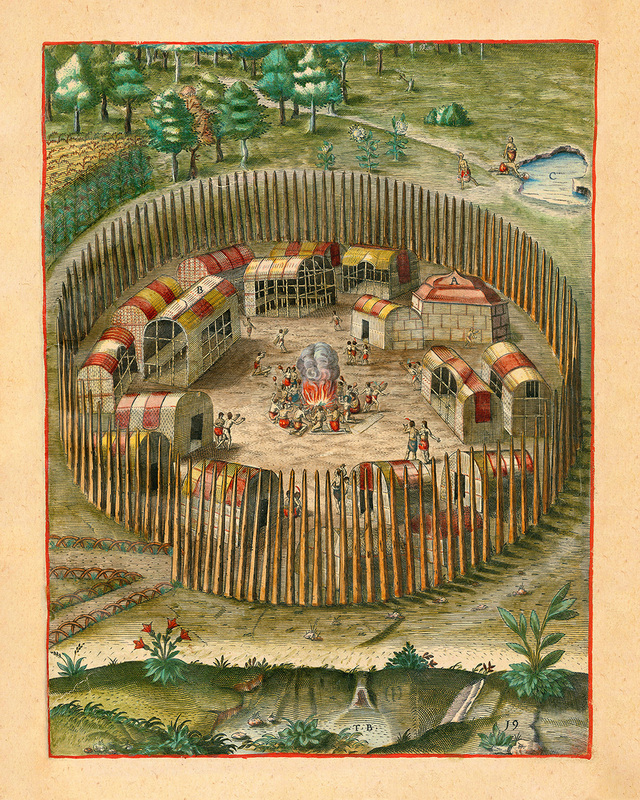 The traumatic effects of the exchange, particularly of disease’s near extirpation of huge swaths of Indigenous populations, have compelled historians to re-examine the nature of native societies on the eve of, and in the early years of, contact between Indigenous Americans and European colonizers. Many people once accepted that God had opened America for Europeans to colonize. Historians and ordinary people alike described America as an empty wilderness, ready for the taking. Contemporaries like Amos Adams believed that a “wonderful providence” had prepared the way for English settlers. For example, as some of you noted in your Forum discussions, Adams wrote that a “few years before the arrival of the people at Plymouth [Massachusetts], there is no doubt that God was pleased to send a dreadful sickness among the natives … and the land was, in a manner, depopulated”. Later, for nineteenth-century historians, the beliefs of Manifest Destiny guided much American thinking, and the place of Indigenous peoples was reduced to that of obstacles to a necessary, divinely ordained, progress. And even into the 20th century, while historians increasingly dismissed the role of providence, they still accepted that America was largely empty –- “a howling wilderness” –- and that while Indigenous people’s fates were unfortunate they were primitive peoples, lost in a tide of western advancement. What’s most interesting about all these stories is that they’re not about Indigenous peoples; they’re about the advance of Western colonization, and they occasionally explain the consequences of that march for Indigenous peoples. This week, we try to counter that pattern by examining the histories of some Indigenous peoples in the early years of contact with European peoples. But again we face difficulties with sources for examining these past cultures. As was the case for Africa, our sources this week are almost entirely of European origin, and thus their accuracy is very much open to question. Sometimes, the poor quality of that knowledge is evident. Much of what passed for knowledge about Indigenous peoples was very much the product of people’s imaginations. The painting to the right, by the 16th-century Dutch painter Jan Mostaert, depicts an imagined episode from a real event: the Spanish conquest of Mexico. Painted only forty years after Columbus’s voyages, it’s striking that even in this painting by a Dutch painter, where he was clearly depicting the Spaniards as violent invaders, the predominant impression relates more to the primitive manner of the peoples. But it’s not a painting from experience. Mostaert had never been to America; he had only read some accounts coming out of Spain. 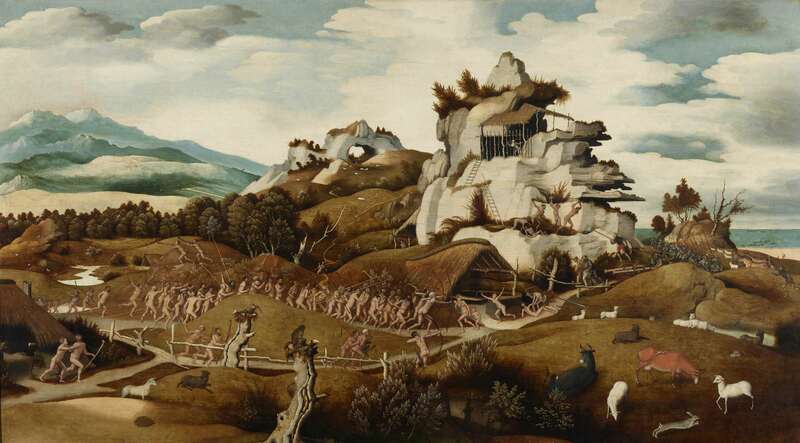 The landscape, like the actual event, was entirely made up: it’s an agrarian paradise with naked people (like Adam and Eve before the Fall) under a heavenly sky. But Indigenous peoples weren’t naked (indeed, in these regions, just like in Europe, the elites wore finely made clothing); they lived in large complex cities, not caves; and while agriculture in the region was substantial, there were no cows or sheep anywhere in the New World until after colonization. This is how a European man, who had never seen the New World, using the Old World and Biblical imagery as a template, imagined it must look. Many viewers at the time, and today, assumed it bore some resemblance to reality. There’s very little reason to assume it does. 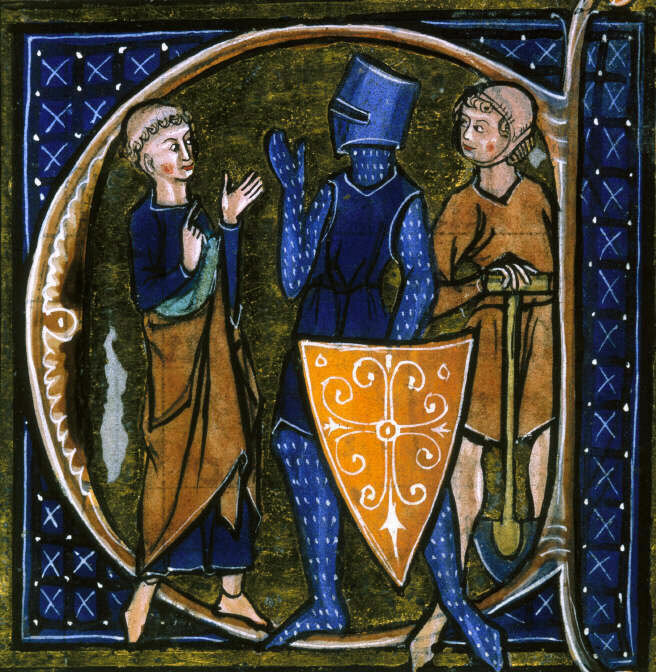 Travellers' accounts offer us greater confidence, though even here there are problems. Early colonists such as Samuel de Champlain, who sailed for France into what is now modern-day Nova Scotia and Quebec, left detailed descriptions of the flora and fauna of the region. He also offered us a remarkably accurate map drawn after only a few years travelling through territory wholly unknown to European cartographers. While Champlain would spend thirty years in Canada, and eventually learn to speak Algonquian dialects, in these early illustrations and writings his intimate knowledge of Indigenous cultures was very limited. His 1612 map​, which beautifully illustrates indigenous plants and the coastal geography, also offers us a detailed illustration of the "Almouchquois" (a now unknown group based in what is now southern New England) and Montagnais (people based in south-central Quebec), but even here we need to realize that Champlain was not the artist and that these images were drawn by an European illustrator based loosely on Champlain's descriptions. Were they purely fanciful, like Mostaert's, or are they true depictions? Probably neither, but where accuracy ended and fanciful began is a tricky question. By far our best accounts come from some of the missionaries who wrote about their activities in the New World. We’ll read much more about the missionaries in our next week’s readings, but for now it’s enough to know that missionaries wrote some of our best available sources on early modern Indigenous peoples. Though clearly influenced by their European perceptions, the missionaries -– especially the Jesuits writing the Jesuit Relations –- were keen observers, genuinely interested in understanding their subjects' cultures and societies because they believed the best way to convert them was to understand them. And so while we must read their accounts critically (i.e., with questions about their reliability), we’ll see that they often appreciated the intelligence of their Indigenous hosts. 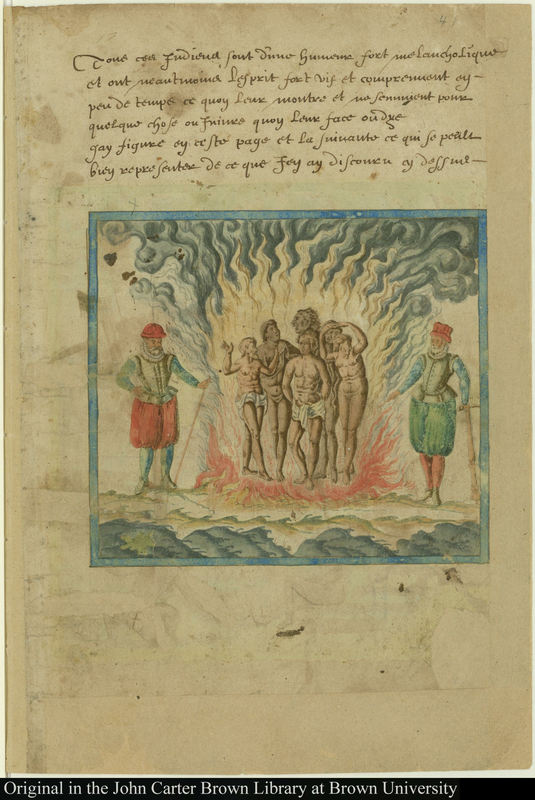 At the same time, we have some accounts by commercial and military men, such as Marc Lescarbot and Baron Lahontan, who offer richly detailed accounts of their experiences. Each presents their accounts through a lens, but as we've seen in our examination of Africa we can nonetheless see otherwise obscure details of Indigenous life in the 17th century. Stepping back from all of this, we can see that much of what we know about early modern Indigenous peoples came through those lenses: the visual, if largely imagined, views of primitive peoples, the fragmented reports of different peoples in different places from different sources, and the careful, if still prejudiced, views of our missionary-ethnographers. As you’ll see, careful readings by modern historians such as Neal Salisbury have opened new windows on how to think about those societies. But even Daniel Paul, a Mi’kmaq man, trying to tell his people’s history –- the “we” in the title –- is handicapped before even he starts. And yet, with imaginative use of sources and a keen critical eye, new perspectives are still possible. In short, your task this week is to read the sources carefully and closely using all your skills of historical thinking. Review past Toolbox entries before you read the sources, and practice applying the skills you've learned. Father Andrew White, "A Brief Relation of the Voyage unto Maryland, 1634", in Clayton Colamn Hall, ed., Narratives of Early Maryland, volume 1 (New York: Barnes & Noble, 1910), 39-45. Thomas Heriot, A Briefe and True Report of the New Found Land of Virginia: of the Commodities and of the Nature and Manners of the Naturall Inhabitants (1588), 34-44. Pay attention to the page numbers! Baron Louis-Armand de Lom d'Ares Lahontan, New Voyages in North America, vol. 1, Reuben Gold Thwaites, ed., (Chicago: McClurg, 1905), 121-35. Marc Lescarbot, Nova Francia, or The description of that part of New France which is one continent with Virginia (London: George Bishop, 1609), 242-57. Chrestian Le Clercq, New relation of Gaspesia: With the customs and religion of the Gaspesian Indians, translated and edited by William F. Ganong, (Toronto: Champlain Society, 1910 ), 100-8. Neal Salisbury, “The ‘Indians’ Old World: Native Americans and the Coming of the Europeans”, William & Mary Quarterly, Third Series, 53, 3, (1996), 435-58. What role did missionaries play in the colonization of North America? and be able to discuss the significance of missionaries in the history of colonial North America​. Note that besides the Forum for this week there are no extra assignments nor an exam in HIST 2F90 this year (meaning 2018; there will be more quizzes and a final exam in 2019)! This is the last Forum of the term. We're aware that you're all really busy with assignments and exam preparation in other courses. For this reason, we'll again be a little more flexible with the schedule for the Forum discussions for this week. The Forum opens on the afternoon of Thursday, Nov. 29, and it will stay open until Saturday, Dec. 8. We'll also leave the Indigenous Peoples Forum open until Friday, Nov. 30 (one extra day). Some of the Forum Groups are engaging really, really well with the sources, and holding strong discussions. If you're contributing in an active way, excellent -- and keep it up! If your engaged but your group is not, do your best to encourage others to discuss ideas and evidence with you. And if you haven't been so engaged lately, try your very best to finish the term in a strong way. Everyone should plan to post at least twice this week (i.e., before Dec. 8). To be more specific: Everyone should make their first post no later than mid-day (1 pm) on Tuesday, Dec. 5. This will leave lots of times for replies and further exploration before Saturday, Dec. 8. This week you should read all of the primary sources and one of the secondary sources [see below] before you begin your posts. What can we learn about Indigenous peoples from the Jesuit Relations? What can we learn about Jesuits from the Jesuit Relations? We already had you think about missionaries' views of Indigenous peoples. This week, consider what we can learn specifically about the missionaries themselves from their writings about Indigenous peoples. Looking at any of these primary sources, can you see points where there might be different ways of interpreting them? Or where interpretation is unclear? How would you characterize the views of Blackburn and Seeman​? Do they see the Jesuits in the same way? Do they see the relationship between Jesuits and Indigenous peoples the same way? Most of our traditional expectations on the native-newcomer relations focus on differences between the two. Do these readings allow us to think about similarities? If so, what are they? As we saw in our examination of imperial expansion, one of the reasons put forth in support of colonizing America was that Christianity could be brought to its “heathens”. Thus, from the very beginning, missionaries accompanied expeditions and settlements in the New World. In the Catholic countries -– France, Spain, and Portugal –- these missionaries were organized typically through the larger religious orders such as the Society of Jesus, more commonly called the Jesuits (we learned about them in Module 1). The Jesuits were one of the most important orders in Christian history, and their influence particularly in education remains significant around the world today (for example, Pope Francis comes from a Jesuit background). They were founded in the wake of the Reformation, and their military-like organization and evangelical zeal marked them as key players in the Catholic Church’s efforts to battle the Protestant reformers. These were strong, dynamic, and intelligent men. 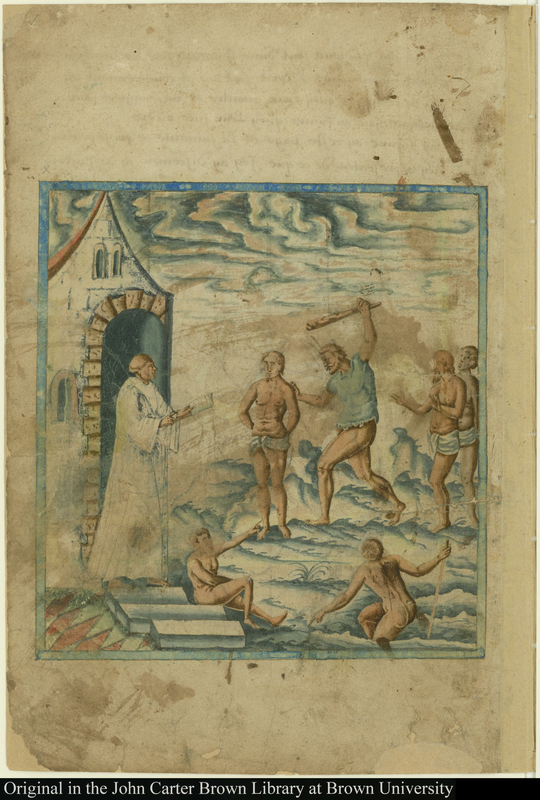 Unlike the monks who retreated into monasteries for contemplation, prayer, and self-examination, the Jesuits went out into the world determined to defeat Protestant “heretics” and to reach the minds of “heathens”. The Jesuits were active around the globe, and their most important roles were in missions and education. These two roles came together in New France in the 17th century. For historians, the Jesuits are important not only for the role they played in the colonization of New France, but also in their writings, the Jesuit Relations. At a time when less than half the population could read and fewer still could write, Jesuits received very good educations. They read classical texts, and could write very effectively. 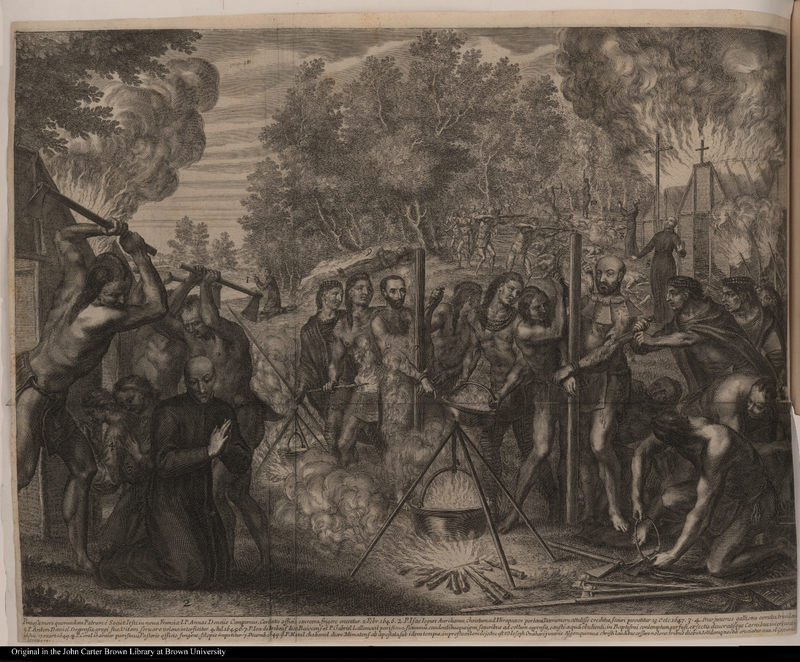 In relating their experiences, the Jesuits provided remarkable portraits of the peoples of the New World, while also justifying​ the costs involved in the missionary project. And, because northern Indigenous peoples were pre-literate societies, the Jesuit Relations are among the best sources remaining to us for understanding the early years of contact between European and Indigenous peoples. We will explore the question of cultural relations more this week, but an important basic issue is just what these texts can tell us. Though clearly effective in describing the Jesuits’ views of the encounter with Indigenous peoples, it’s much less clear what they can tell us about the Indigenous people they purport to describe. The role of the Jesuits has been controversial. 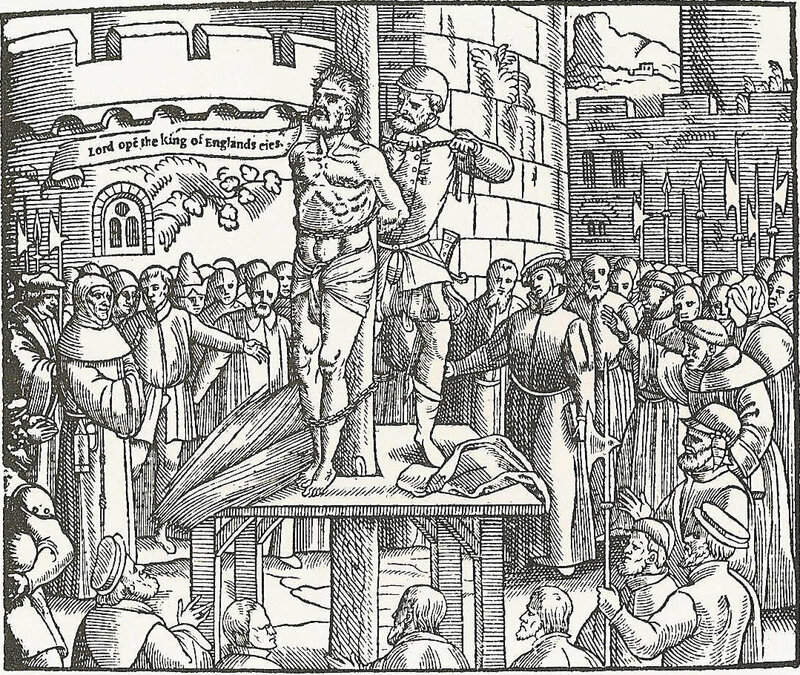 While in the past much of this controversy was mired in confessional (Catholic/Protestant) and national (British/French) prejudices, there remains significant debate over whether the Jesuits should be interpreted as engaged in the sincere higher calling of proselytizing (spreading the Word of God), or as agents of empire. Were their interests tied only to converting non-Christians, or were they actively aiding the colonizing forces? Or, however they imagined their actions, were they doing both? All of which leads us to our key question: Who were the Jesuits? Who were these men? What were their motivations? Were they agents of empire, or God? Or both? Recent historians have focused on the cultural impact as well as the motivations of the Jesuits. The aim of these historians has been to assess the impact of the Jesuits on Indigenous people, the place of Jesuit writings in shaping European understandings of the New World, and how that helps to understand the broader story of empire in the early modern Atlantic World. As you’ll see, our two main secondary readings have quite different views of the nature of that relationship. The differences between Blackburn and Seeman illustrate the interpretative nature of historical writing. Like most authors writing on the Jesuits, they rely on the Jesuit Relations –- writings by the Jesuits themselves relating their experiences for an audience back in France –- but take quite varied meanings from their sources. The Jesuit Relations are complex texts and can be seen as both faithful accounts and propaganda, as both accurate and profoundly misleading. It’s not surprising then that historians offer very different ways of understanding the meeting of Europeans and Indigenous peoples. Review all of the Toolbox entries from last term before you read the sources, and practice applying the skills you've learned so far in this course. As usual, make sure that you're signed into Sakai before you try to access these sources. If you have any issues write to the Instructor Role in Sakai and make sure that you also choose the "Send Cc" option. Chrestian Le Clercq, New Relations of Gaspesia: With the Customs and Religion of the Gaspesian Indians, translated and edited by William F. Ganong (Toronto, Champlain Society, 1910 ), 207-14. Joseph Robineau de Villebon, “Memoir Concerning the Conduct of the Missionaries of Acadia, 1693”, in John Clarence Webster, ed., Acadia at the End of the 17th Century: Letters, Journals, and Memoirs of Joseph Robineau de Viillebon, Commandant in Acadia, 1690-1700 (Saint John, NB, New Brunswick Museum, 1979 ), 49-52. To find out which group you're in, see the introductory post in the Forums for last week's Forum. Erik R. Seeman, The Huron-Wendat Feast of the Dead: Indian-European Encounters in Early North America (Baltimore, Johns Hopkins University Press, 2011), 59-79. We want to explore these books' different perspectives. Obviously, they are talking about different people at different times, so it's not the subjects we want to compare, but the general viewpoint and arguments each suggests. Each author interprets the place of Jesuits differently. Explore how they arrive at those differences. Everyone should make their first post no later than mid-day (1 pm) on Tuesday, Dec. 5. This will leave lots of times for replies and further exploration before Friday, Dec. 8. These images tell very different stories. In other words, they provide you with a chance to identify conflicting interpretations in primary sources. Consider the significance of violence in general, and martyrdom in particular, in these images. The next Lesson and Forum on Colonial Societies will be ready by Wednesday, Jan. 9, 2019.